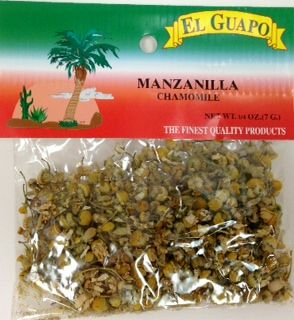 Chamomile dry flowers Chamomile - Manzanilla tea is used as a sedative and for insomnia and other nervous conditions. The tea has anti-inflammatory properties, it is good for rheumatism, arthritis, and other painful swellings. It is an antispasmodic for intestinal and menstrual cramps, relieving gas pains, acts as a very mild but efficient laxative, and loosens tight muscles. Manzanilla - El te de Manzanilla Chamomile o Camomila es muy relajante, bueno para combatir c�licos estomacales, malas digestiones, problemas de sue�o y dolores de la menstruaci�n. Dolores nerviosos de cabeza. Uso externo: para inflamaciones de ojos y conjuntivitis.